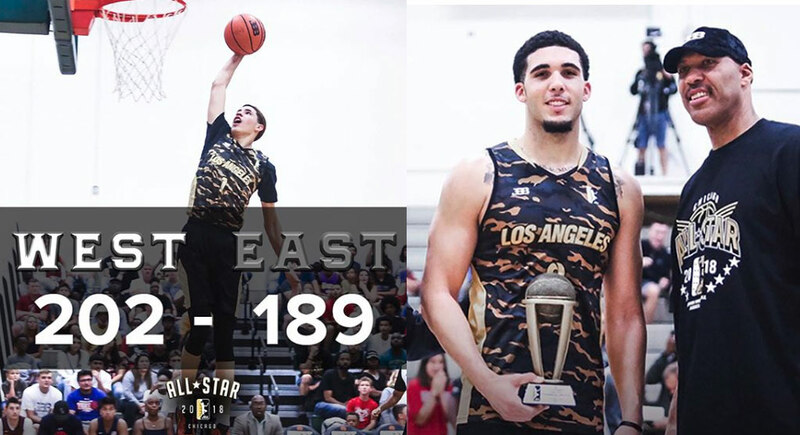 After watching LiAngelo Ball average a league-leading 52 points (on over 40 shots a game) and LiAngelo Ball put up 40 points (2nd), 11.5 ASTS (1st) and 14.5 REBS (4th) during the inaugural season of the no-defense-allowed JBA League, I said one of the two brothers was going to either put up 81 to 100 points or have a 50-point triple-double in the All-Star game. I was wrong. Together, they combined to equal Kobe’s NBA career-high and the game high went to a non relative of the Ball family: Deon Lyle, who had 51 points and shared co-MVP honors with Gelo. Gelo finished the game with 39 points, 15 rebounds and 7 assists. He shot an efficient 18-of-34 from the field but was just 3-of-14 from three. He wasn’t much better in the three-point shootout, which was won by Seattle Ballers’ Brandon Willis. Melo finished with 42 points (18-30 FG, 4-13 3PT), 17 assists, 8 steals and 7 boards. He passed on participating in the three-point shootout and dunk contest, which was won by Houston Ballers’ Nick Lovelace. I was also wrong about another thing. I said they would fail to fill up the arena since the games throughout the season had such poor attendance. I also assumed they were going to play in another arena and not a sports complex with your typical high school size bleachers. But, LaVar said he isn’t concerned about the absence of butts in seats at the live events. Social media is where it’s at right now. Everybody comes in there and they say ‘Well the JBA is not doing too good’ when they look in the stands. But is it better to have all cameras in there and 100 people or 10,000 people in there with no cameras. The scouts want to say ‘Hey is that guy good?’ If you have 10,000 people in there and no cameras, it’s just people saying he’s good. So when the cameras is in there (sic) and they playing in arenas and they say this kid is good, press rewind and we’ll watch him again. Well, here’s some more footage from those cameras.